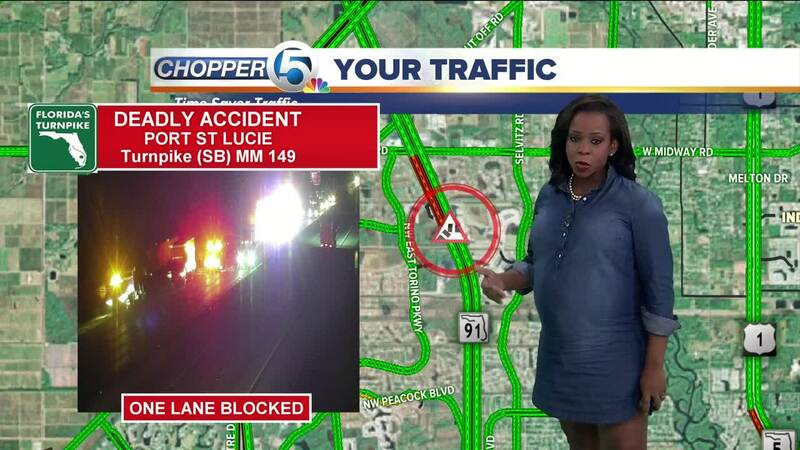 The Florida Highway Patrol is investigating a fatal overnight crash on Florida’s Turnpike southbound in St. Lucie County. PORT ST. LUCIE, Fla. — The Florida Highway Patrol said a 76-year-old driver from Miami died in an overnight crash on Florida’s Turnpike southbound in St. Lucie County. The wreck occurred around 2:43 a.m. Wednesday at mile marker 149 in Port St. Lucie. FHP said the crash involved a 2004 Hyundai Tiburon and a double tractor-trailer combination. The driver of the Tiburon, identified as Lonnie James Ross Jr., was ejected from his car. The tractor-trailer became jack-knifed on the western grass shoulder, and a second tandem trailer overturned. All southbound lanes have been reopened. At 9:40 a.m., FHP said the cleanup on the shoulder continues.